The past shows that the city and its buildings are much more livables if they know how to dialogue with nature, and understanding how the local climate works can be projected differently. Today the environmental problems and our relationship with nature have become a real focus of urban developments, which is why, it is wise to look back at how tradition set out the occupation of the territory. 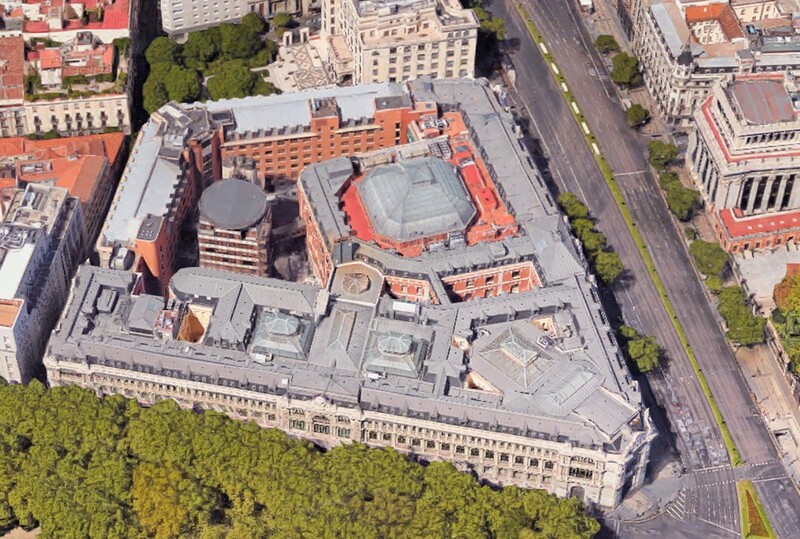 Located in one of the most crowded places in Madrid, around Cibeles Square, the Bank of Spain has undergone a process of growth where the configuration of the palatial courtyard was lost with the appearance of the “Torre Cibeles”´s courtyard. This filled a space of the building that was as identity as the build. 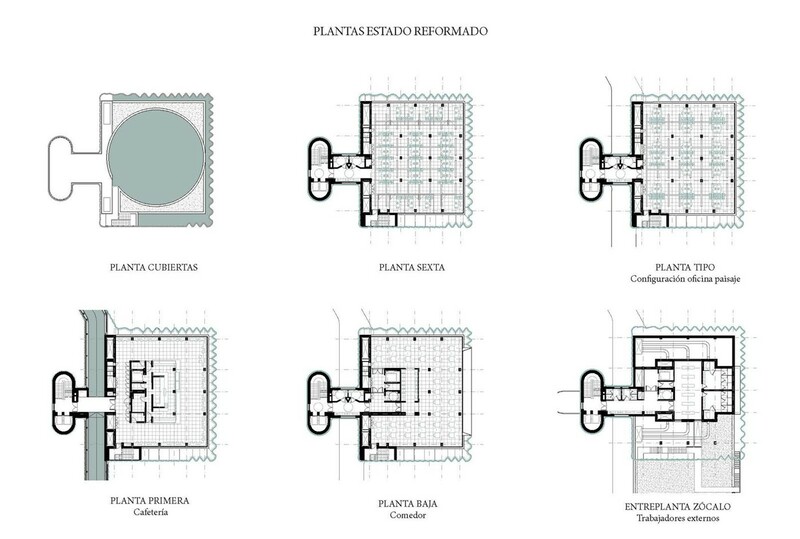 Everything seems to point out that the proposal of rehabilitation is requesting for an idea that will appease the environment, an approach that allows to move from the current imbalance to the rest of the desired wooded courtyard. Therefore our proposal bring up to recover, in an artificial way, the wooded courtyard that ended the lost urban sequence. To this end, it is bring up the introduction of a building organism, a bioclimatic tree that interacts with the environment improving environmental conditions thanks to the use of design and technology. The rehabilitation action we are proposing is focused on intervention on three general systems that allow us to reconstruct the functioning of the organism in a global way. 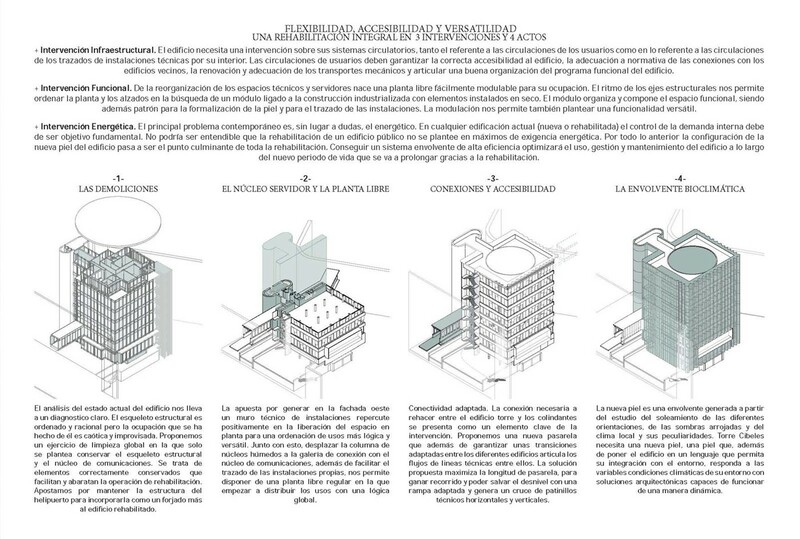 We act based on three pathological groups that are generating the wrong running of the building in its current state: the infrastructural, the functional and the energetic. 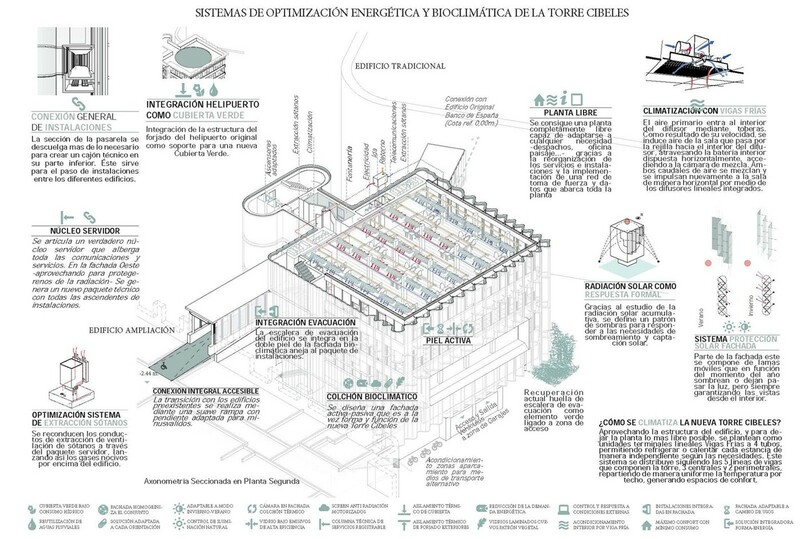 The building needs an intervention on its circulatory systems, user´s circulations and the circulations of the routes of technical installations by its interior. 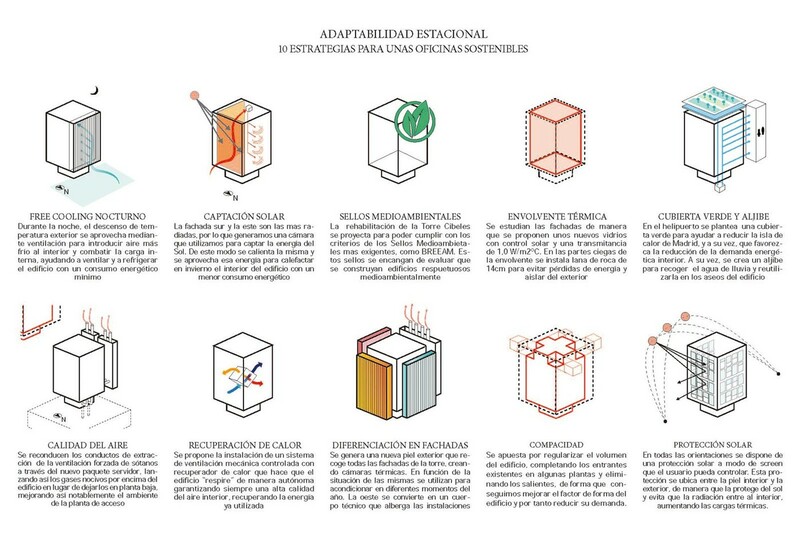 User circulations must guarantee the correct accessibility to the building, the adaptation to regulations of the connections with the neighboring buildings, the renovation and adaptation of the mechanical transports and articulate a good organization of the functional program of the building. The optimization of the technical skates system and server spaces will be fundamental to be able to propose a logical fit and adjusted to a contemporary office use. A correct reordering of the current technical spaces can reveal a much more optimized plant. 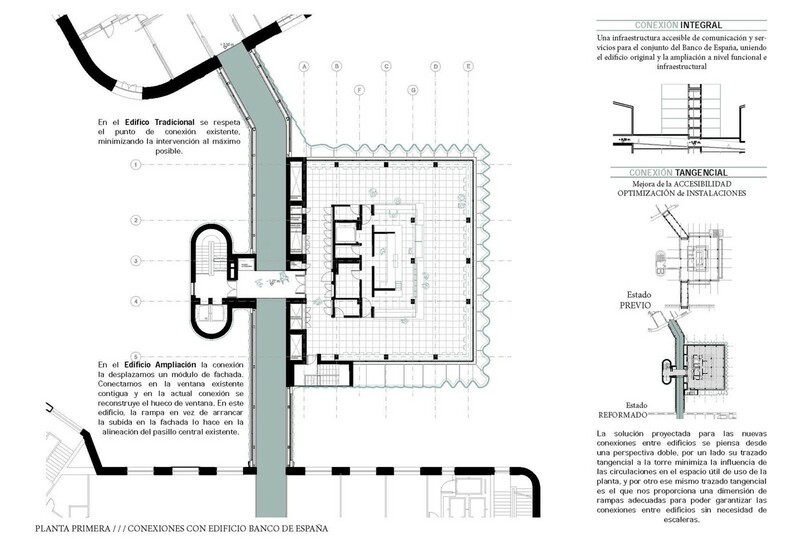 From the reorganization of the technical spaces and servers rise up a open-plan adapted for its occupation. 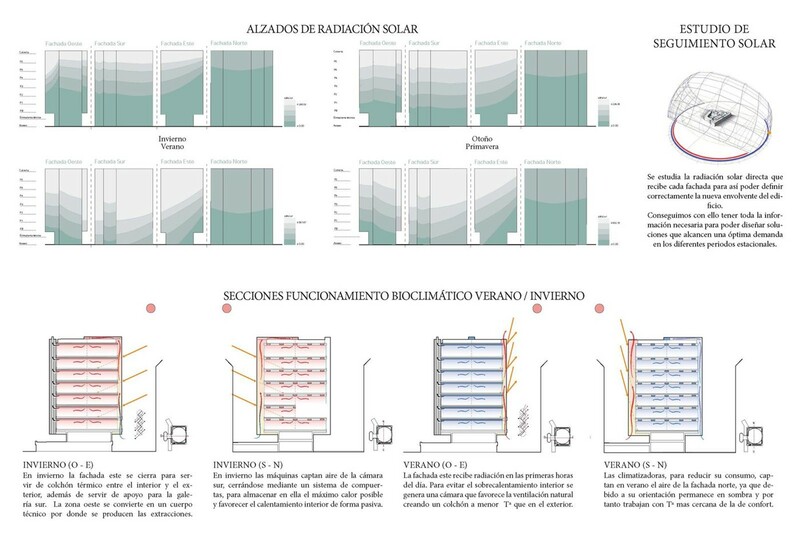 It looks for a module linked to the industrialized construction with elements installed in dry. This modulation also allows us to propose a versatile functionality, in use and in its occupation. In any current building (new or rehabilitated) the control of internal demand must be a essential goal. The reduction to the minimum of the demand is today a compromise. Therefore it could not be understood that the rehabilitation of a public building does not bring up at maximum energy demand. 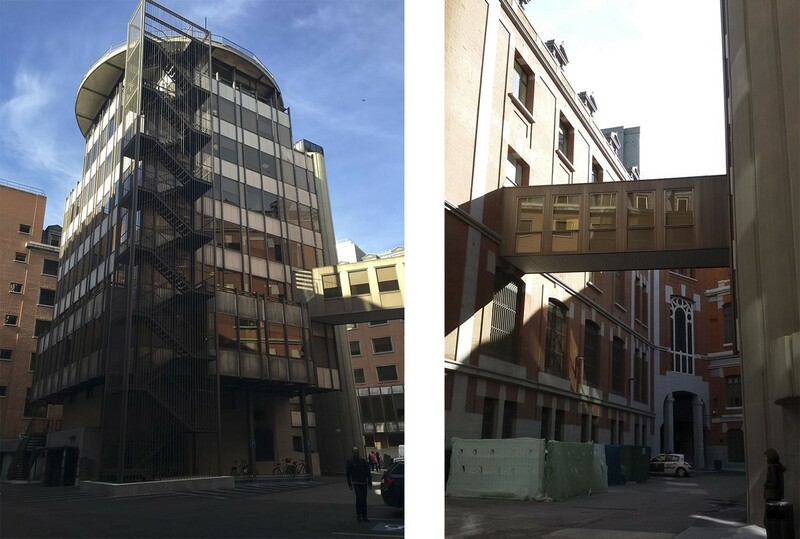 The configuration of the new skin of the building goes over to be the highlight of all the rehabilitation. If we achieve a high efficiency envelope system we will be facilitating the proper use, management and maintenance of the building over the new period of use that is extended thanks to the rehabilitation.